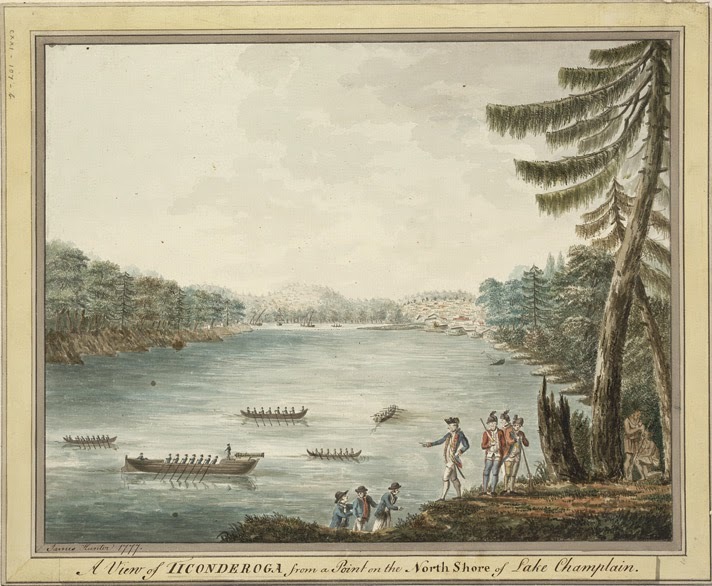 A View of Ticonderoga from a Point on the North Shore of Lake Champlain, James Hunter, 1777, British Library. Thanks to Steve Rayner for pointing out this piece! James Hunter painted this watercolor during the Saratoga campaign. Fort Ticonderoga played a key role throughout the early years of the American Revolutionary War, and can still be visited today! Lake Champlain, on which Ticonderoga lies, was the site of one of the more exciting naval engagements of the Revolution only the year before. Though a technical victory for the British, the 1776 Battle of Valcour Island ended with the British abandoning the New York campaign for a year. The 1777 campaign was famously disastrous for the British, ending with the surrender of Burgoyne's army. Hunter may have painted this piece in the days immediately prior to the capture of Ticonderoga, or shortly thereafter. The capture of the fort was a major boon to the morale of the army, and may have imbued them with false confidence in their ability to march through New York. There are a number of sailors in this piece, manning a variety of small craft to patrol the lake and carry troops and supplies along the waterway. In what appears to be a row galley on patrol, an officer stands by a substantial bow gun while tars in matching round hats with tall crowns and upturned brims, as well as blue jackets, pull away. The coxswain in the stern wears much the same as his crew. The officer appears to be wearing a blue coat with red facings: the uniform of the Royal Artillery. Perhaps the RA was given command of a boat or two? Or maybe the galley is merely escorting the officer across the lake. We get a much more detailed view of the tars on Lake Champlain in the foreground. Three tarpawlins make their way up a hill toward an artillery officer and some light infantry. All of them wear the same blue short jacket without cuffs, and with mariner's flap cuffs. Likewise, they wearing black felt round hats, though the fellow in the back has a much wider brim (and downturned at that) than his mates. 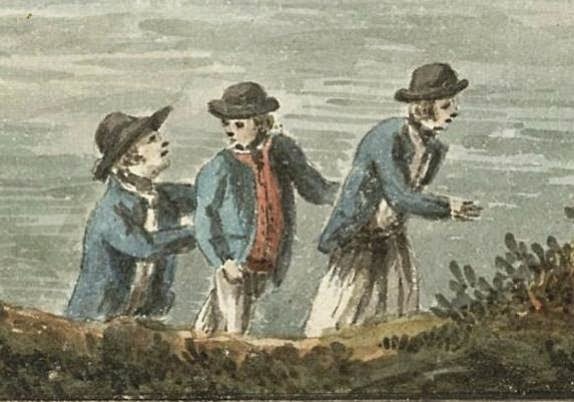 The Jack in front wears a single breasted white waistcoat, as does his mate in the back. The mariner in the center wears a double breasted red waistcoat. All of them wear black neckcloths. It is difficult to say whether the sailors to the left wear trousers or slops, but it appears that the sailor in front is decidedly in slops.